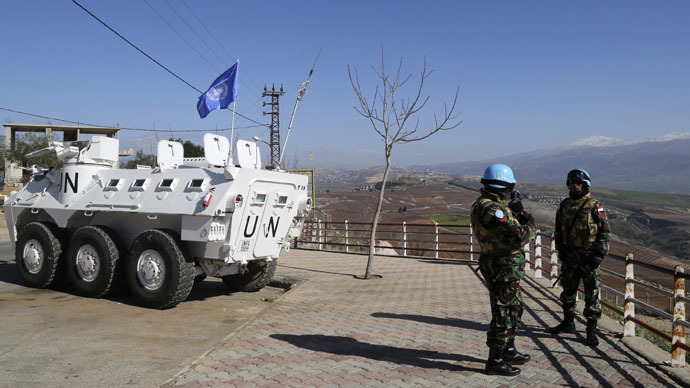 Israeli military appears to have deliberately targeted UN peacekeeping watchtower in Lebanon which left a Spanish UN peacekeeper dead back in January, a confidential military report said, citing testimonies from peacekeeper’s colleagues. Corporal Francisco Javier Soria Toledo, a Spanish soldier serving as a member of United Nations Interim Force in Lebanon UNIFIL was killed in the exchange of hostilities between Lebanese militant group Hezbollah and the Israel Defense Forces (IDF) along the Israeli-Lebanese border on January 28. IDF shelled the area after Hezbollah attack that killed two Israeli soldiers. "Every time, they [Israelis] corrected the trajectory from Majidiye [location] to the 4-28" post, where the UNIFIL peacekeepers were stationed,” Corporal Ivan Lopez Sanchez, who was stationed nearby, told Spanish investigators, according to El Pais newspaper which saw the report. The paper published the testimony of another Spanish soldier, Sergeant Julio Xavier Garcia, who said that shells initially fell about 500 meters north of the UN post and then they "corrected the trajectory towards the position." Garcia added that he took cover along the watchtower "to clearly see it was a fixed shot” and that “falling projectiles were getting closer." "The first projectiles hit behind the mosque, near Majidiye, and were slowly falling further to the right, closer and closer,”another witness, soldier Christian Martinez said, adding that the last two explosions were very close: “one fell behind the concrete wall of the parking and the second directly hit the main tower." The Spanish newspaper also quoted a UN report which said that Israeli forces had warned at 11:39am local time that UN peacekeepers should remain in their positions and avoid going outside, without providing any further details. According to the report, the Israeli army fired on the area at least 118 artillery shells, 90 mortar grenades and five projectiles between 11:48am and 1:43pm local time. Spain and Israel have agreed to carry out a joint probe into the corporal's death. Late in January a video has been released claiming to show the moment of the attack. The footage suggested Israeli artillery, retaliating against Hezbollah rocket attack, might be responsible. The video supported a claim by Spain’s ambassador to the UN regarding the origin of the missile that killed the Spanish peacekeeper. Foreign Minister Jose Manuel Garcia-Margallo said it “most likely” came from Israel. The United Nations peacekeeping mission in southern Lebanon, deployed since 1978, includes 600 Spanish soldiers in a 10,000-strong force.